Almost spontaneously, the Libyan city of Benghazi has been galvanised into action. That this sentence is nigh-on meaningless is not our concern, our concern is with the word galvanised, and what it has to do with a frog's testicles. 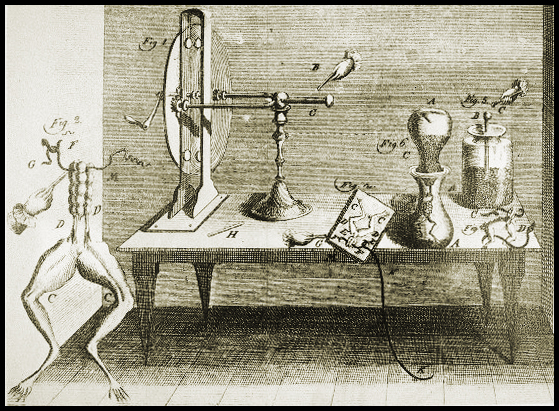 Once upon a time, in 1791, there was an Italian fellow called Luigi Galvani who thought that frogs' testicles were contained in their legs. Even the best of us have stray thoughts like that occasionally, but Galvani decided to cut a frog's leg open to see if he could find them. He couldn't, but something odd happened. He had previously been experimenting with static electricity and one of his scalpels contained enough charge that when it touched the frog there was a little spark and the frog's leg kicked. This was odd as the frog was dead and the leg had been cut off. Galvani became excited. 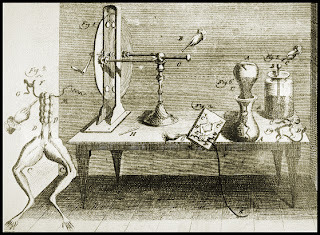 Luckily his friend Alessandro Volta had just started making primitive batteries called Voltaic piles (from which we get volt), so Luigi was able to have great fun massacring frogs, hooking them up, and making them dance. I remember my old science teacher explaining that he had attached a thousand frogs to a huge metal frame and waited for a thunderstorm and watched them kan-kan. I do not know whether this is true. Perhaps a corpse would be re-animated; galvanism had given token of such things: perhaps the component parts of a creature might be manufactured, brought together, and endured with vital warmth. And thus wrote Frankenstein. Charlotte Brontë wrote about being galvanised to "new and spasmodic life" and Sydney Smith advised "Galvanise a frog, don't galvanise a tiger". This illustration should make it all clear. P.S. You can also use galvanism to coat things in metal. Goltz confirmed Spallanzani's observations and threw new light on the mechanism of the sexual instinct and the sexual act in the frog. By removing various parts of the female frog Goltz found that every part of the female was attractive to the male at pairing time, and that he was not imposed on when parts of a male were substituted. By removing various of the sense-organs of the male Goltz further found that it was not by any special organ, but by the whole of his sensitive system, that this activity was set in action. If, however, the skin of the arms and of the breast between was removed, no embrace took place; so that the sexual sensations seemed to be exerted through this apparatus. When the testicles were removed the embrace still took place. It could scarcely be said that these observations demonstrated, or in any way indicated, that the sexual impulse is dependent on the need of evacuation. Professor Tarchanoff, of St. Petersburg, however, made an experiment which seemed to be crucial. He took several hundred frogs (Rana temporaria), nearly all in the act of coitus, and in the first place repeated Goltz's experiments. He removed the heart; but this led to no direct or indirect stoppage of coitus, nor did removal of the lungs, parts of the liver, the spleen, the intestines, the stomach, or the kidneys. In the same way even careful removal of both testicles had no result. But on removing the seminal receptacles coitus was immediately or very shortly stopped, and not renewed. The things we do to frogs! This made me feel quite ill. 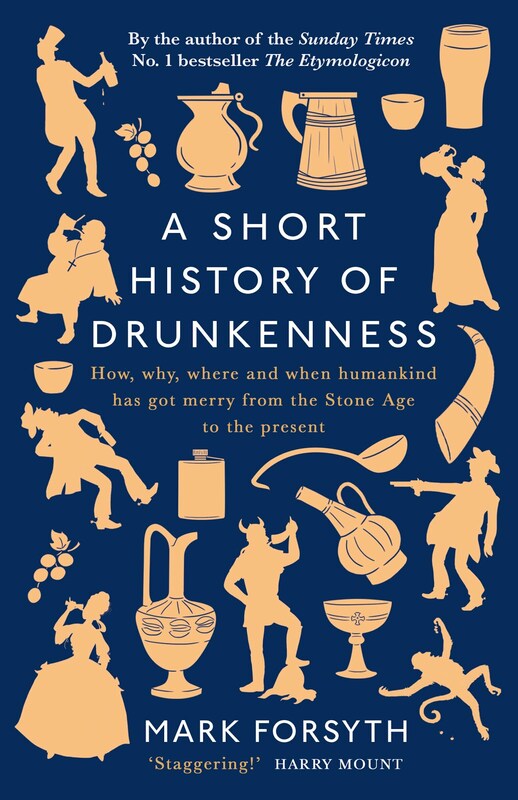 Substitute "human" for "frog" in the accounts of Galvani and especially of Havelock Ellis (thanks for putting it in small print) then read it again. I dream of the day when frogs will get their revenge. I'm sure I'm being simple, but why is the BBC sentence void of meaning? I was able to inference what it meant. Can you tell me, so I don't make the same mistake please. Fanks. I think the quote was actually quite accurate! Someone's froggy testicles have been tickled with a bit of voltaic juice and the twitching will go on for some time, unfortunately.